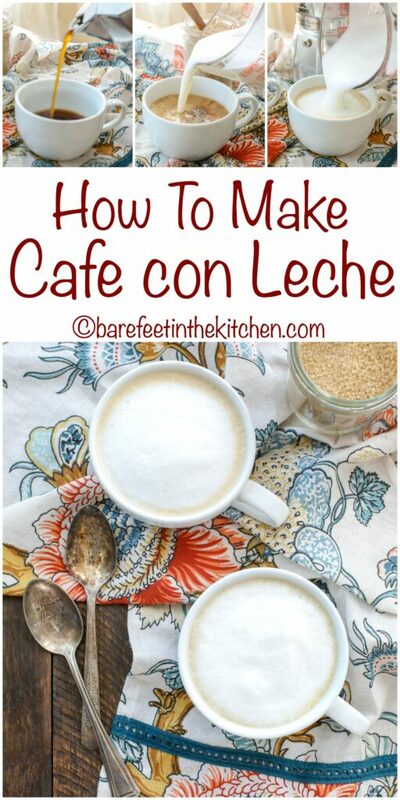 Cafe con Leche is a creamy hot drink made with espresso and milk. I enjoy mine lightly sweetened, but many people prefer it unsweetened. 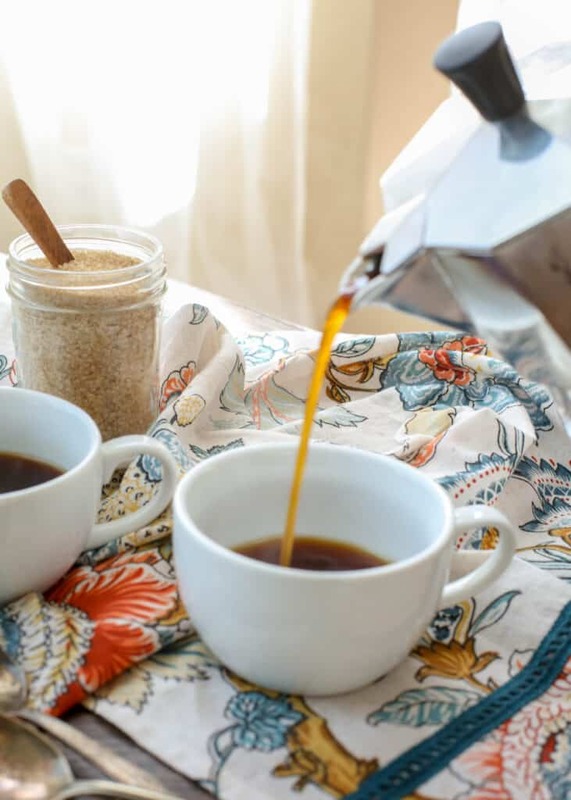 It’s easier to make than you might think and you don’t need a fancy countertop espresso machine to make it. A few years ago, my sister Jenny vacationed in Spain with her husband. They both returned home with a love for Spanish Cafe con Leche. They shared their love of this creamy coffee drink with us when we visited them and I was hooked from that first sip. I had never before been a coffee drinker, but that changed as soon as I tasted Cafe con Leche. The very next morning after we returned from visiting them, I ordered my own stovetop espresso pot and a milk frother. For the past 5 years, I have been brewing my own cafe con leche almost every morning. I love it. 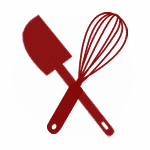 I have served this to friends and family numerous times and it has been much loved. I have a couple friends that joke about coming back to visit and staying longer, just to enjoy this every morning. 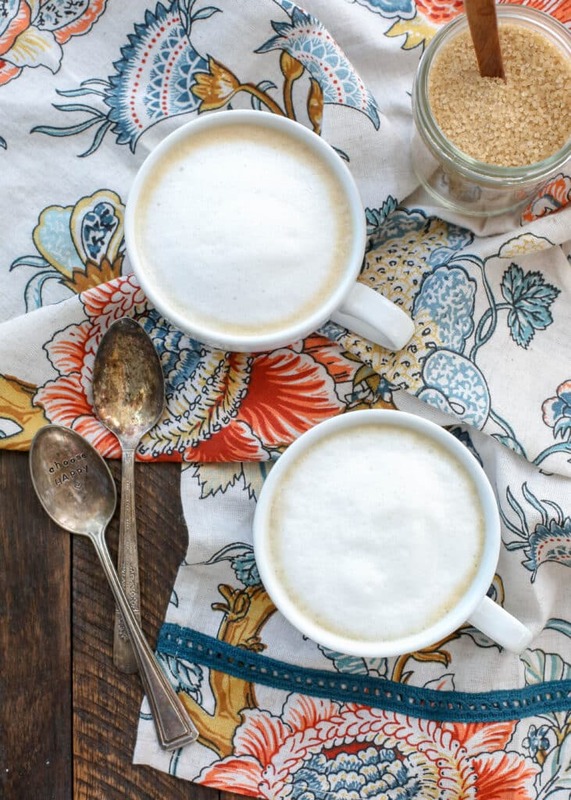 This is not merely an at-home substitute for fancy coffee-shop lattes, this drink puts those coffees to shame. Cafe con leche is Spanish for coffee with milk. It is a hot coffee drink made with espresso and scalded milk in approximately a 1:1 ratio. Sugar is added according to taste. I like mine fairly sweet and my sister prefers hers barely sweetened at all. 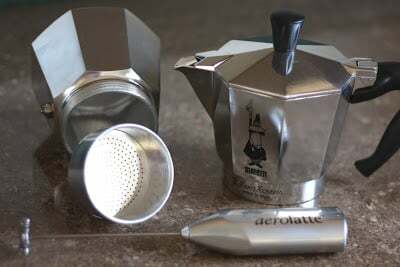 * Please note that this is an espresso maker, not a regular coffee pot. The “3 cup” size produces only 6 ounces of espresso, enough for 1 large or 2 small cups of cafe con leche. Set the burner to medium (medium high on my current stove, but I used medium on my other stove). Within about 10 minutes, the espresso will have pushed through the filter and filled the top of the pot. Remove it from the heat as soon as the pot is full, do not let the espresso boil or it will burn. While the espresso is heating, place the sugar in a large cup or divide it between two small cups. 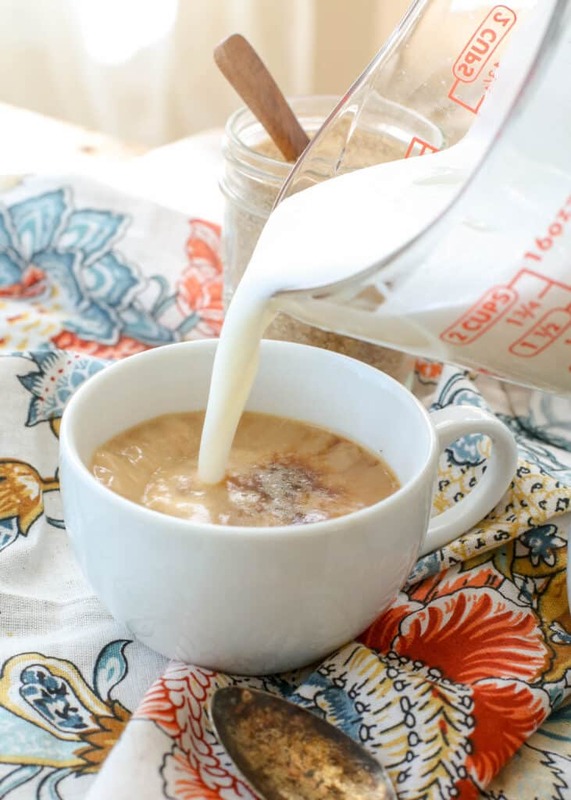 Pour the milk into a large 2 cup measuring cup and warm it for about 90 seconds in the microwave. Or if you are using the stovetop to scald the milk, start it on low when you start the espresso. When the espresso is finished, pour it over the sugar and stir for a few moments to dissolve the sugar. Froth the milk until it has doubled in size and then pour the foamy milk over the coffee. Stir to combine. Serve hot. 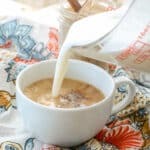 For more homemade drinks that are better than the coffee shop, try this Homemade Chai Tea or the London Fog. This Peppermint Mocha Latte and this Butterscotch Caramel Coffee are on my list to try soon. 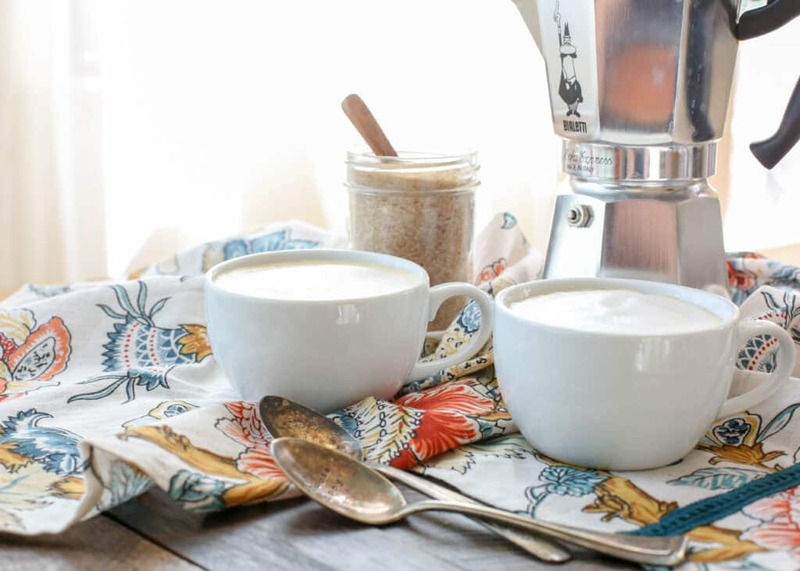 Kitchen Tip: I use this stovetop espresso maker and this milk frother to make this recipe. When the espresso is finished, pour it over the sugar and stir for a few moments to dissolve the sugar. 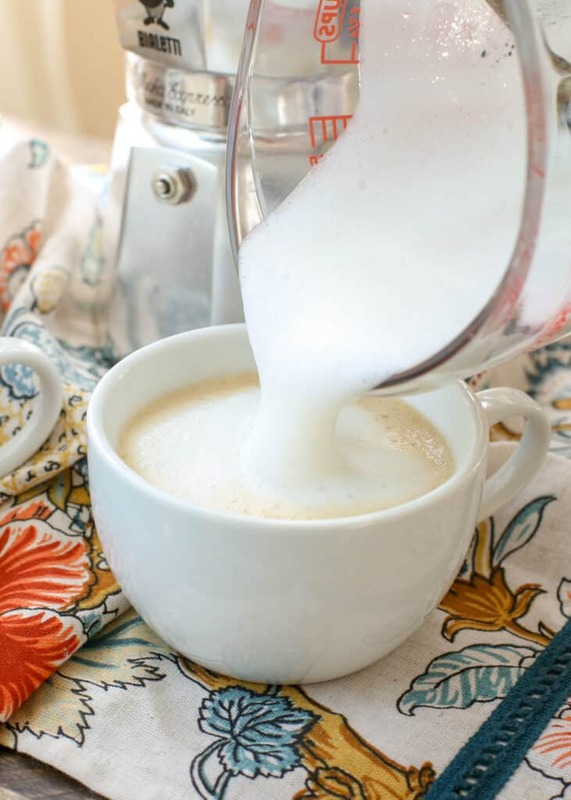 Froth the milk until it has doubled in size and then pour the foamy milk over the coffee. Stir to combine. Serve hot and Enjoy! * Please note that this is an espresso maker, not a regular coffee pot. The "3 cup" size produces only 6 ounces of espresso, enough for 1 large or 2 small cups of cafe con leche.